When Duncan Phillips arrived at Yale University in 1904, he was interested in pursuing English and writing. He wrote about art during his time there, but was disappointed at the absence of an art curriculum; Yale had dropped its only art history course due to a lack of student interest. After visits to the Met in New York, Duncan penned the essay “The Need of Art at Yale,” which issued “a reasoned plea for the creation of a course in art history that would prepare students” for enjoyment of the world (George Heard Hamilton, The Eye of Duncan Phillips: A Collection in the Making). Duncan Phillips’s views on arts education are as relevant as ever. His essay reads, “A wider diffusion of artistic knowledge and instinct would give birth and guidance to dormant individualities of taste, and would not only increase the number of future artists and art critics, but would help to color the lives of the future citizens of the republic, and thus advance the precious cause of the beautiful, in this marvelous breathless modern world.” With this, Duncan put art as a prerequisite to experiencing humanity and served as an early advocate for arts education. 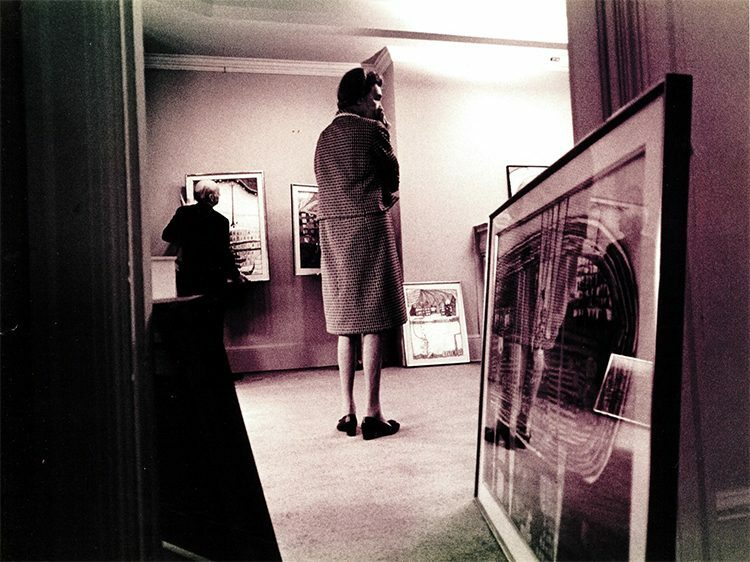 One of my favorite photographs in the archives is of Marjorie Phillips in 1969 when she was Director of the museum installing a Hundertwasser exhibition alongside Jim McLaughlin, the museum’s curator. She stands in a room, framed by doorway, giving the viewer a glimpse into the workings of installing exhibitions and putting her front and center, instrumental to the process. As Marjorie looks pensively at the unhung pieces, her image is reflected in the glass of one of the works. The hints of color expose the transition between Duncan and Marjorie’s directorship, with his death preceding the Hundertwasser exhibition by three years. Marjorie was responsible for many milestones in The Phillips Collection’s history. She opened the museum’s first show of outdoor sculpture after putting together a landmark show, “Birds in Contemporary Art” in 1966. In the catalog for it she writes “in no half century has there been such a diversity of concepts, of materials used, degrees of abstraction or realism experimented with!” Marjorie was a confident director with an artist’s eye who was formative for the museum. 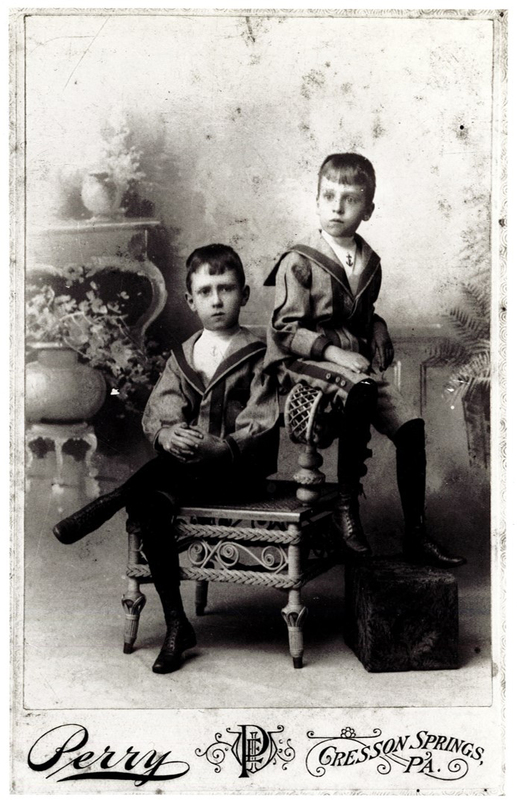 Duncan and Jim Phillips as boys. See the introduction to this series here. Duncan Phillips and Jim, his older brother by two years, were quite close. Jim even waited two years to attend Yale University so that he and Duncan could go at the same time. In 1918, after traveling and collecting art together, Jim died in the Spanish flu epidemic at the age of 34. Duncan’s father, Duncan Clinch Phillips, had died the previous year. The sense of family is reflected in The Phillips Collection, which doesn’t resemble most museums or white-cube galleries, but a home. 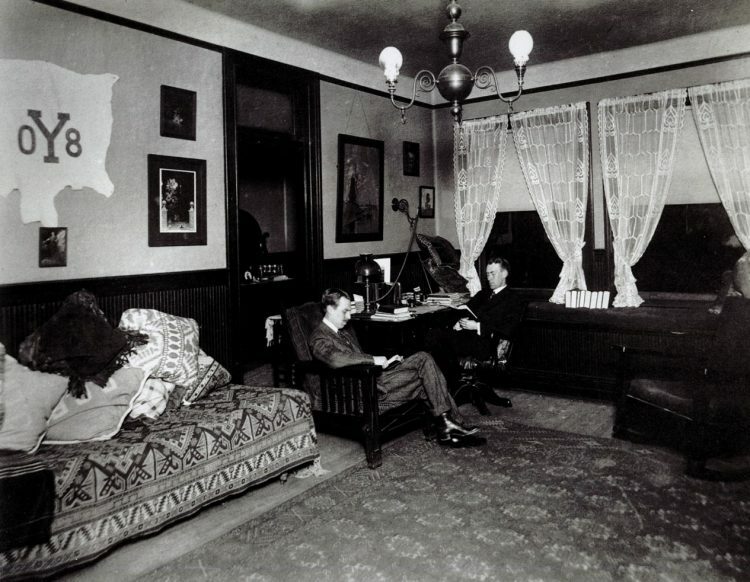 Hughes quotes Duncan as saying “we plan to try the effect of domestic architecture, of rooms small or at least livable, and of such an intimate, attractive atmosphere as we associate with a beautiful home.” It’s particularly striking to look at old photos of the galleries and see plush furniture, ashtrays, and a coffee table. However, this unusual approach is seamless and makes the viewer feel at home, admiring the old fireplaces, and picturing the galleries as former dining and living rooms. The atmosphere Duncan invented encouraged visitors to linger.